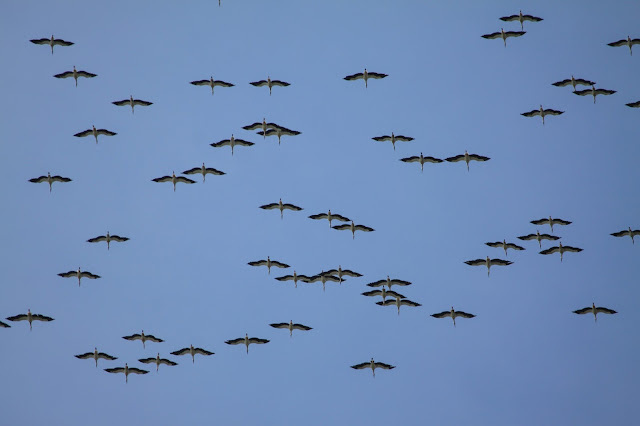 What now seems like ages ago we ploughed across northern Europe heading for Sweden and the Falsterbo Bird Show hosted by BirdLife Sweden. 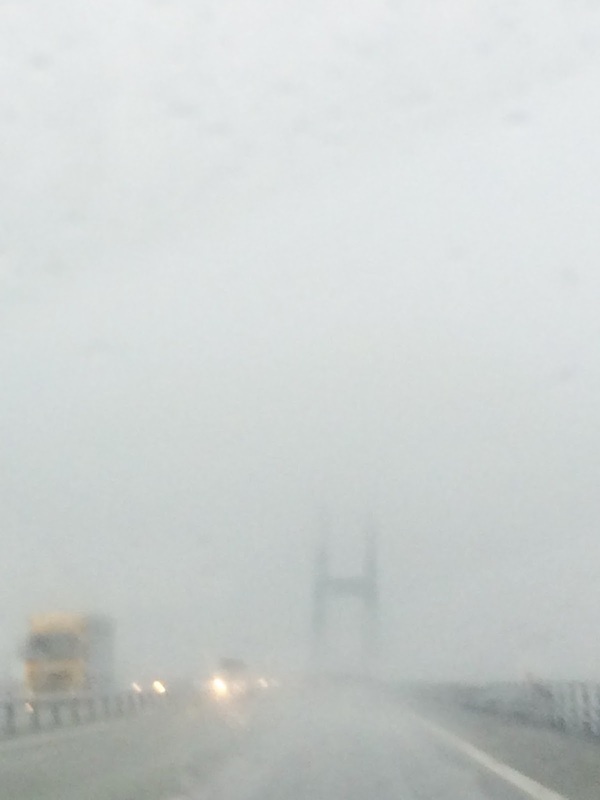 We picked up this miserable weather in Germany and it remained with us all the way through Denmark. We entered the tunnel at Copenhagen in a downpour and exited the other side in sunshine, amazing. This annual event is growing every year and we really enjoy visiting, not just for the wonderful raptors that pass overhead during the day, but also the friendly atmosphere and general bonhomie. 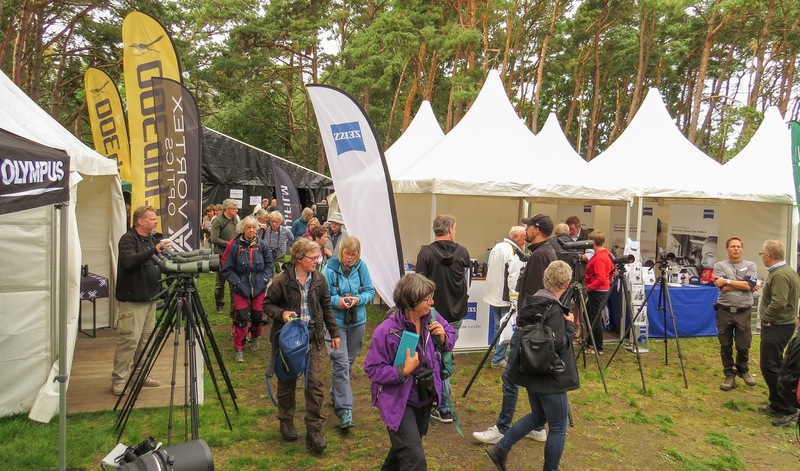 Outside the main marquee at the Falsterbo Bird Show. This year's highlights for the birds were a couple of Lesser Spotted and White-tailed Eagles and best of all an unprecedented number of White Storks in a single kettle circling over the showground. Each year so far we have been privileged to give a talk and our profile in the country is growing fast with many people coming to see us at the stand and some even waiting for our visit to purchase Wader Quest merchandising; especially the earrings it seems. 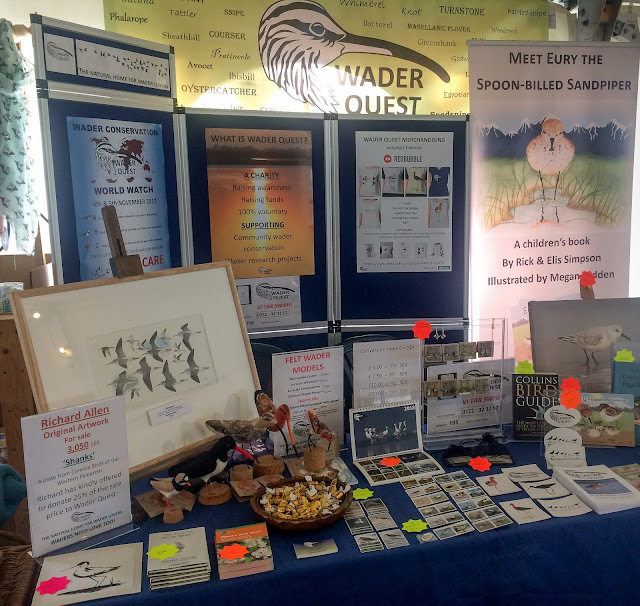 The Falsterbo Wader Quest stand. We were very lucky with the weather again this year, it was sunny most of the time but a few brief showers passed by almost unnoticed. 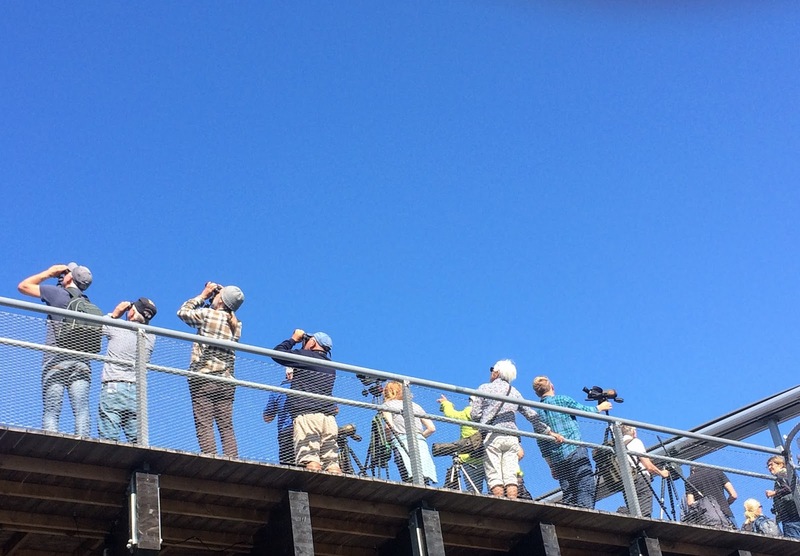 Birders under blue skies atop the Strandbad building for raptor watching. As usual our friends Anna and Eva were the perfect hostesses catering for our every need even though Anna had her own stall this year which they were both busy preparing for. Anna (R) and Eva had the stand next to ours which came in handy on the rare occasion when we needed translation English/Swedish. We were sorry that Lars Jonsson was unable to come this year as this meant that apart from enjoying his company, we couldn't bring back any of his amazing posters, but we'll try to find another way. However Erik Hirschfeld was there with his AviFauna stand and we were delighted to enjoy another sumptuous dinner with him in his flat in Malmö. 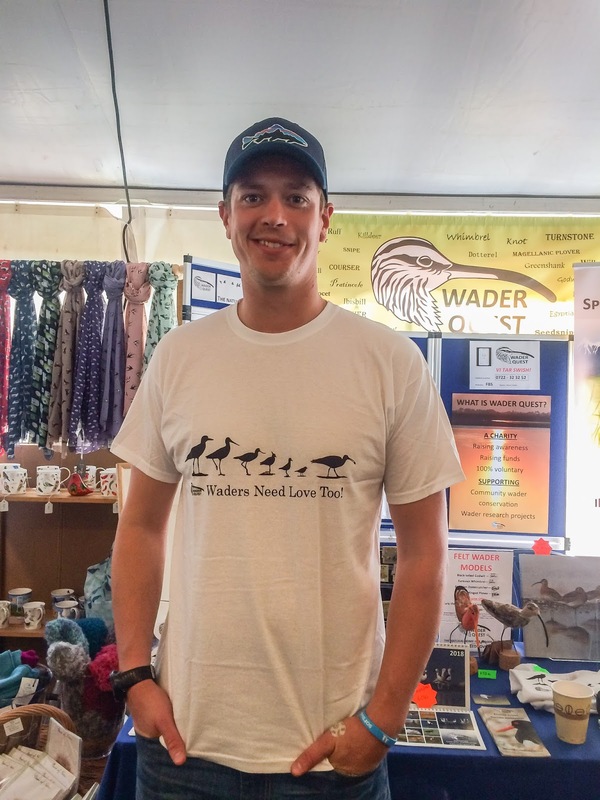 Linus Hedh models the 'Waders Need Love Too!' T shirt he just bought. 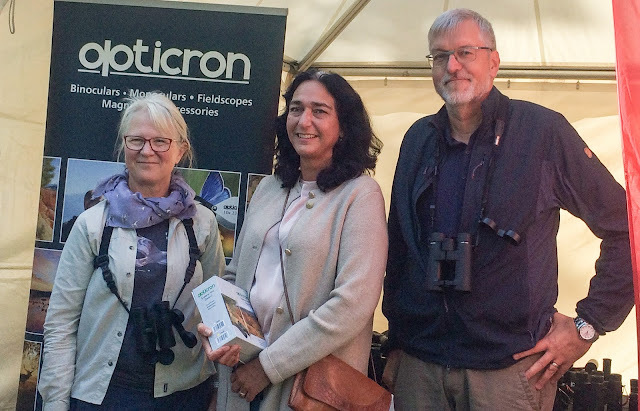 As far as optics people were concerned we had a great meeting with the delightful Nanette Roland of Leica about the future of Eury the Spoon-billed Sandpiper book (watch this space for more news soon). We were impressed by Matts and Ingrid who were manning the Opticron stand this year, for the first time, with great success making some good sales. Very pleasing as we had transported the stock with us to the show. 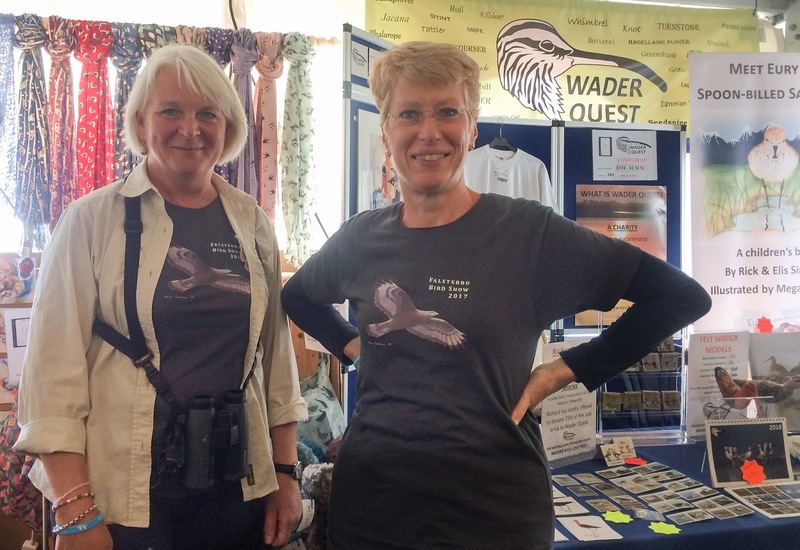 Matts (R) and Ingrid (L) with another successful sale. All in all it was a very satisfying trip, even though the drive to and from was exhausting, especially the return trip as we were under pressure to get back to head for Lancashire for a talk on the Tuesday evening at the East Lancashire Ornithologists' Club, which, I'm pleased to report, we managed to attend and enjoyed immensely especially when they elected to become Club Sponsors of Wader Quest. 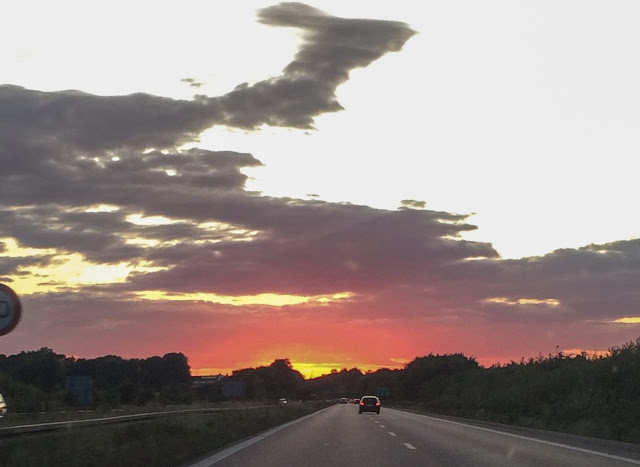 Sunset over Denmark as we headed for home.